Can the box office rebound from a rather unimpressive February that was dominated by the eventual Best Picture winner? Given that three films released in March 1990 ended up as the fourth, fifth, and sixth highest grossing movies of the year, the answer is obviously "YES." This month also saw a six-year old box office record fall one week, followed by the release of two forgettable Latin-themed dance movies the next. We also saw the first major box office success for a future star. March 1990 definitely came in like a lion but didn't go out like a lamb. 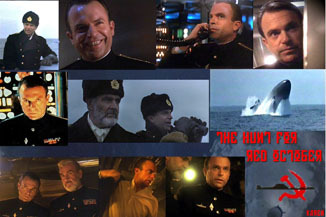 To kick off the month, Paramount launched the first Jack Ryan film in the form of The Hunt for Red October. Apparently, the expectations of powerful box office scared away all competition as this was the only film released during this weekend. As expected with Sean Connery as the headliner, despite his questionable "Russian" accent, the film cruised into the number one spot with $17.2 million ($28.9 million adjusted to 2008). While these are not figures that blow away our jaded box office perspectives of 2008, this debut amount was a new record for a non-summer or non-Thanksgiving opening, which was previously held by 1984's Beverly Hills Cop and its $15.2 million (released on December 5th). When you couple that record with a very robust screen average of $14,010 from 1,225 screens, The Hunt for Red October seemed to be the only movie of consequence in theaters. Curiously, this would be the only outing for Alec Baldwin as Jack Ryan, but of the four Ryan films, his film would be the second highest grossing, unless you count Air Force One, which pretty much felt like an unofficial sequel. Unfortunately for Driving Miss Daisy, it took a Russian nuclear submarine to permanently unseat her reign at number one, but she would have to settle for number two with $5.1 million ($8.6 million adjusted). This was only a slip of about 16% but Miss Daisy's total was just too feeble to compete against a summer movie released in the spring. While Steven Seagal's Hard to Kill slipped 22% to $4.2 million ($7 million adjusted), Madhouse with John Larroquette and Kirstie Alley barely moved with a drop of 9% to $3.1 million ($5.2 million adjusted). Born on the Fourth of July continued to hold on for Oliver Stone with another fifth place finish of $2.1 million ($3.5 million adjusted), down 16% like Jessica Tandy's film. Jack Ryan's freshman outing actually faced a trio of releases in week two that all ended up in the top five but thanks to none of them being very powerful at the box office, The Hunt for Red October retained the number one spot. With the addition of another 440 screens and a slip of only 18%, the Clancy film sailed away with another $14.1 million ($23.7 million adjusted). The second place finish belongs to the first of Tom Hanks' 1990 releases, Joe Versus the Volcano. Warner Bros. apparently believed in the film that is a punchline in and of itself, as Joe Versus the Volcano on over 1,800 screens had the widest release of any film in theaters. Maybe, the studio saw this first pairing of Tom Hanks and Meg Ryan as a surefire hit, but it didn't exactly explode in theaters. It managed to collect $9.3 million ($15.6 million adjusted), which is a decent haul, except it comes out to only a little more than $5,000 per screen. On a positive note, it would ultimately earn $39.4 million ($66.1 million adjusted).With a supporting cast featuring the male version of the Golden Girls (Lloyd Bridges, Robert Stack and Abe Vigoda), Joe Versus the Volcano's box office success sits squarely on the shoulders of Hanks and Ryan, who was hot off the success of When Harry Met Sally. Undoubtedly, this weekend's true success story was actually the third place finisher and comes in the form of a novelty rap act's inexpensive feature film debut, House Party. Remember, this was 1990 and easily-digestible, mainstream pop rap acts were quite in vogue, such as MC Hammer, DJ Jazzy Jeff and the Fresh Prince (hard to believe that Will Smith got second billing in this lineup), and Kid N Play. House Party starred Kid ‘N' Play and churned out $4.6 million ($7.7 million adjusted) from only 520 screens, which gave it the highest per screen average in the top five. With a cumulative gross of $26.4 million ($44.3 million adjusted), of course New Line would go back to that well and turn this into a theatrical trilogy over the next four years. Depending upon your opinion, House Party is to be blamed or thanked for allowing Martin Lawrence enough screen time to showcase his talent that would lead to a sitcom and film stardom.